The Hulu Theater at Madison Square Garden (recently known as simply “The Theater at Madison Square Garden” before Hulu purchased the naming rights in 2018) is a theater located within New York City’s famed Madison Square Garden (if you couldn’t have guessed based on the name). While it’s a much more intimate setting for a live event (concert, comedy show, etc.) than the main arena venue in which it’s located, it can still hold up to 5,600 people for certain events and provides great seat views throughout the entire house. Below we will provide a detailed seating chart review with information on seat numbers, seat views, and more. If you’re looking to find the cheapest tickets for events at The Hulu Theater, be sure to check out TickPick for the cheapest ones that will NEVER include any service fees! The seat numbers in the Hulu Theater at Madison Square Garden can be very important when determining the quality of seats, particularly when you’re looking at the sections on the sides. The way The Hulu Theater seat numbers work is that when you’re facing the stage, seat number 1 will always be on the left of the section and the highest seat number within a row will be on the right side. 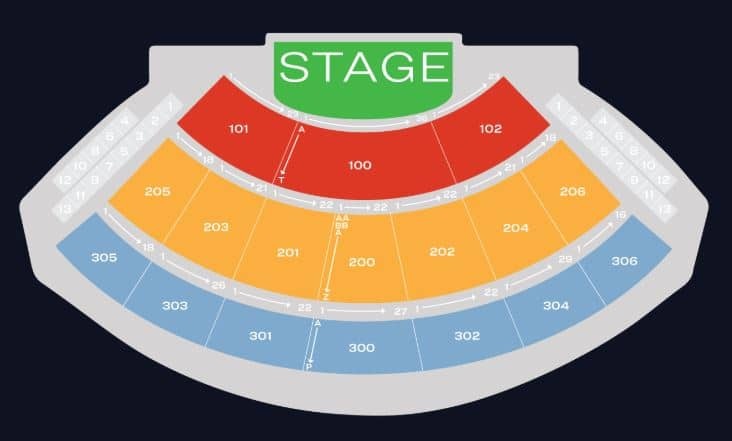 This means that when sitting in the odd number sections 101, 201, 203, 205, 301, 303, or 305, you would want seats with a higher seat number so that you’re closer to the center of the stage and vice versa for seats on the other side of the theater. For example, seat number 1 in section 204 is next to section 202 and seat number 21 is next to section 206. The seating arrangement at this theater differs from other “theatres” that people may associate with the nominal stage and setup in that the venue offers one large tier that starts at the back of the venue at its highest point and makes its way all the way down to the stage, where the seats closest to the stage are at the venue’s lowest point. There are no separate tiers such as mezzanine or balcony levels (as are with Broadway theatres, for example), and for that reason, there are no overhangs or deceptive views for this venue’s seating arrangement. The further back a seat is located (the 300 sections are further back than the 200s, and 200s are further than the 100s), the further away from the stage it is in general. All of the 100s sections (100-102) are great, but our only warning is that if you’re looking at seats in sections 101 or 102 (the sections furthest off to the left and right, respectively), make sure that your seats are closer to the inside aisle towards section 100. All of the 200s sections are deemed “full view” by the venue; however, there’s a difference between sitting in the outermost sections like 205 and 206 and sections inside of those that are closer to the center-most 200 section (the angles will be worse if you’re located way off to the sides), but your budget will most likely dictate where you’ll sit. With that said, we’d avoid the 205 and 206 sections, if possible, and we’d personally choose to sit within the first handful of rows in the innermost 300 sections like 300, 301, and 302 over the outer sections in the 200s. The 300s sections basically follow the same exact pattern as those of the 200s sections in front of them, with the exception of the 300s sections only including rows A-P, while the 200s include Row AA, then Rows A-T. The “worst” seats within the venue would be located in the last few rows of sections 305 and 306, where you’ll be as far away from the main stage as anywhere else in the theater. In all, we believe believe that every seat in Hulu Theater at Madison Square Garden is a good one. The center sections of The Hulu Theater in the 100s and 200s provide a spectacular view, but the box sections located on the sides also provide decent views while being close to the action in a more intimate setting. While there’s not really a bad seat in the house, staying as close to up the middle as possible is your best bet. How Many Seats Per Row at The Hulu Theater at Madison Square Garden? The amount of seats per row at The Hulu Theater depends on what section the seats are in. If you take a look at the chart below, you’ll see that the sections get wider as they get more center, and outer sections like 205-206 and 305-306 have only 18 seats per row. “I’d never seen a show here before so figuring out where to enter was a chore as it is not clearly marked (all roads seem to lead to MSG). If you have GA you enter at the corner of 8th and W33rd. If you have seats you enter between 7th and 8th. Once inside I was pleasantly surprised; you find a nice, small, intimate theater. There is nothing flashy or theater esque about the location but it does serve as a good venue to see a concert. Acoustics were a bit off for the opening band (Refused) but were perfect for the headliner (Faith No More). If you’re looking to buy the cheapest tickets for The Hulu Theater (without any fees) or searching for more information about upcoming events, visit here: the Hulu Theater at Madison Square Garden. And of course, if you have any questions regarding The Hulu Theater at Madison Square Garden, please leave it in the comments below!